As strategists, we’re focused on discerning the unique genius that differentiates an organization and working with leadership to see it become the plumb line of activity. We work with decisionmakers to create next steps-focused operational plans that consider vision or mission, specification (God-stamped organizational brand), equipping to put the right people in the right places serving the right people, and accountability to be strongly at work in God’s purposes at the right time. What makes The Creel ModelSM unique? Our planning model is fluid and organizationally driven. While the Equipping piece of the model is most focused on creating a working roadmap, all four tenets are integrated and critical to understanding the strategic purpose or destination of an organization. We can support the life of an organization at any point on the model, or, drawing from all four tenants, we can create a custom planning session based on the unique needs and desired outcomes of your team. 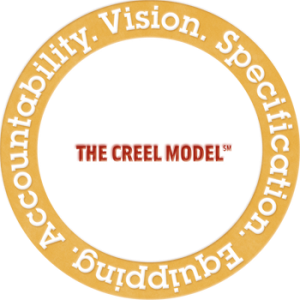 The Creel ModelSM is designed to motivate and enlarge the people who are accountable to action. Many planning processes can be overwhelming and discouraging. The Creel ModelSM equips and encourages servant leaders to finish strong. Click here for a downloadable one sheet about our planning process.